I do still feel like a visitor to Bangkok, despite living here, and given the multifaceted and diverse landscapes of the city, I can escape at any time to unfamiliar surroundings. And to thank for this are Bangkok’s boutique and design hotels which will always bring something new and exciting to the city, away from the blandness of the generic international brands. So we have got into a routine for birthdays, celebrations, unplanned romance or just a break from the cat to just escape to a bit of luxury and here are some of our favourite design and boutique hotels in Bangkok city. Where the hotel is the destination. Starting from the older to our newer additions. Tenface was the first of my obsession with Bangkok boutique hotels, a personal favourite and one of the more affordable of this list. As an interior design student I brought Fanfan to Tenface to woo her with the outstanding concept and creativity of this original, luxury boutique hotel (I won my kudos for it). 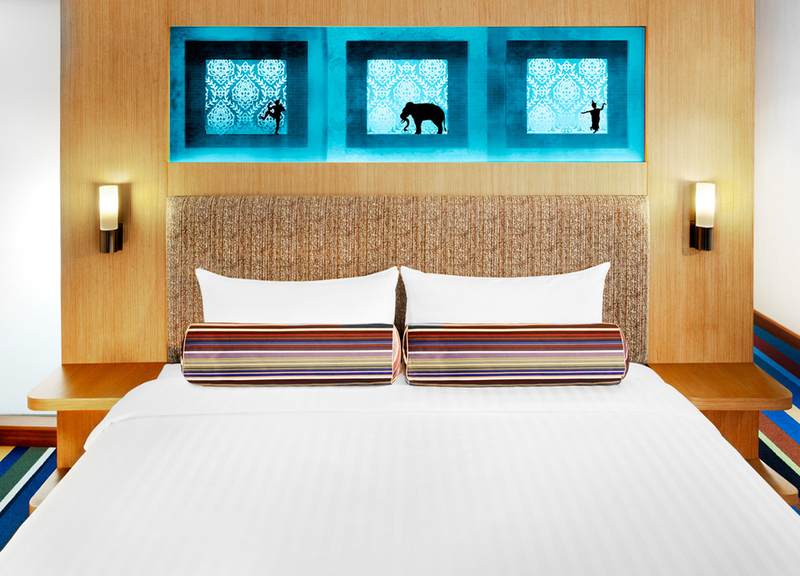 Tenface Hotel is urban, edgy and the design is inspired by the mythical Thai fable of Ramakien following the journey of Tosakan a ten-faced giant who has the ability to see the world different to others. For me it is the ideal urban hideaway and for tourists it encourages the independent travellers to get out and experience the city for themselves with free sim cards, skytrain passes and expert advice from the hotel’s ‘entertainment guru’ who is ‘in the know’ with offbeat attractions and events in the city. While the location isn’t ideal it only takes a short taxi to find both Sukhumvit’s entertainment district and Siam’s central shopping area. The Chit Lom Skytrain station (BTS) also a short walk (or complimentary tuk-tuk). Located on the banks of the Chao Phraya River, the Praya Palazzo Hotel offers a charming riverside experience which in contrast to my high-rise, urban surroundings is a welcome break. It tops my to-do list for boutique hotels, to date unattainable as one of the more expensive boutique hotels of the city (and rightfully so). This place is sincerely beautiful, set in a historical mansion dating back to the ancient kingdom of Siam, now renovated to a stylish, luxury boutique hotel. While hidden from the chaos of Bangkok’s central areas Praya Palazzo is still within easy reach of the Old City and Rattanakosin Island. A short journey brings you to Bangkok’s top historical and cultural attractions including the Grand Palace, Reclining Buddha, Temple of Dawn (Wat Arun) and Bangkok’s Chinatown. Access to the hotel is only by traditional wooden barge. Capturing the beauty of the past, the Sukhothai, named after the ancient Siamese capital, is the most ‘Thai’ of our collection and boasts refined interiors against enchanting Thai artistry. Everything about this boutique hotel is luxury, the suites of teak flooring, luxurious Thai accents and views overlooking the surrounding gardens and decorative Chedi water feature, the Sukhothai is undeniably beautiful. The location is within a six acre compound in the less busy Sathorn area of Bangkok and offers an oasis of tranquility away from the chaotic hubbub surrounding. If you can pull yourself away from the compound a walk (or quick taxi) finds the lively entertainment district of Silom and the nearby Sala Deang Skytrain (BTS) station. Alone the ‘Celadon Restaurant’ is worth a visit, a multiple award-winning Thai restaurant including “Best Restaurant in Bangkok” by Travel and Leisure Magazine (2011). This would be my go-to hotel for visitors to Bangkok’s Sukhumvit area; mostly for the views. While many boutique hotels fail to reach heights of surrounding buildings, the S31 hotel starts on the 8th floor meaning all suites bring top Bangkok city skyline views; views which seamlessly blend with the hotel’s minimal design. The S31 Hotel was created by an award-winning architect (Sumej Jumsai) and the boutique hotel brand ‘the S Group’ have two similar urban retreats nearby – the S15 Hotel and one for the budget traveller The S33 Hotel. Every suite includes an eight foot wide bed, goose down bedding, windows across an entire wall and freestanding bathtubs. The perfect urban hideaway. *Note pay that little extra for a corner Junior Suite with two glass walls and panoramic views. S31 sits on the main Sukhumvit Road between Phrom Phrong skytrain (BTS) and the Asoke Skytrain Station. An escape not only from Bangkok but Thailand and the 21st century. At Shanghai Mansion you’re whisked back to the romance of old Shanghai with suites draped in canopies, lanterns, mustards and clarets. As expected this vintage, boutique hotel is found snug in the centre of Yaowarat Road; the main street of the central Chinatown hubbub. It also gives the ideal vantage point for exploring Bangkok’s Old City and the famous temples within. A short taxi (or long walk) finds the Hua Lamphong underground (MRT) and train station giving access to Bangkok’s convenient rail networks. To replicate the experience without staying at Shanghai Mansion try their swinging on site ‘Cotton Jazz’ bar. So the Metropolitan Hotel is bigger than boutique but the design and on site treats hold it in my top design hotels in Bangkok. The Metropolitan is authentic yet urban with clean lined style against local teak and Thai silk bedrooms and limestone and mosaic bathrooms. The main pull for most however is the onsite Nahm, an award-winning restaurant of Michelin Starred chef David Thompson. Nahm is now rated in the top 50 restaurants of the world and if you plan to do a lot of eating, there are few better places to stay. The Metropolitan Bangkok is found in the Sathorn area not far (short taxi) from the lively Silom area and Sala Daeng Skytrain station. I know very little about Hansar…. other than it wins a whole lot of boutique hotel awards and their Vertigo Suite is in the slickest I’ve ever seen. With multiple awards the Hansar Hotel shows to lead the way in urban boutique hotels worldwide; and it boasts enchanting views, architectural elegance and timeless style. Hidden in a secluded compound away from the 24 hour bustle of Bangkok’s entertainment areas Hansar is yet just a quick taxi to find the heart of the city. A short walk will find the Ratchadamri Skytrain Station (BTS) and Lumpini Park. 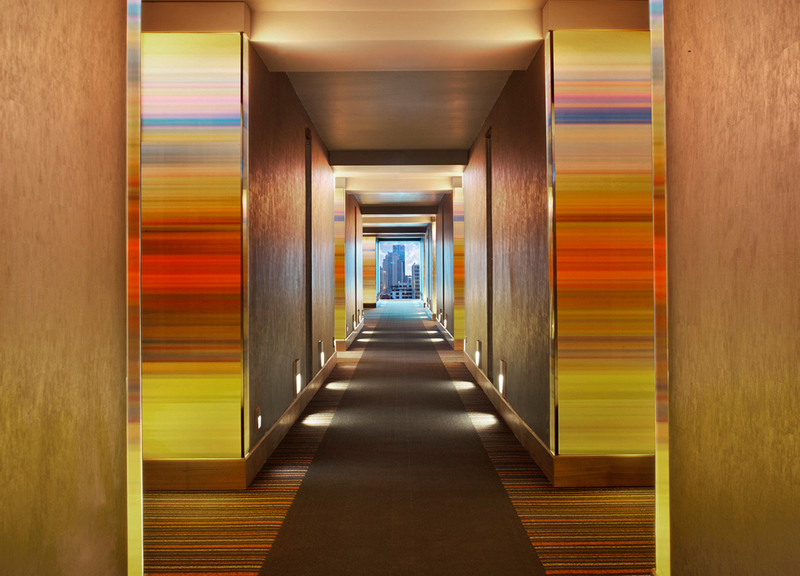 Hotel Muse wins the list hands down for exceptional design and décor. While not exactly ‘Thai’ this plush, urban-residential accommodation devotes ‘turn-of-the-century’ grandeur and its themed concept makes for the perfect escape from city surroundings. The on-site food and drinks venues are equally as distinctive with the Speakeasy Rooftop bar quickly becoming one of Bangkok’s ‘hippest’ hangouts, alone worth a visit. The Muse Hotel is located on Langsuan Road a short walk from Chit Lom skytrain station (BTS) and a quick stop from Central Siam shopping district. Two stops in the opposite direction finds Sukhumvit’s top entertainment and restaurants. Ma Du Zi models itself on privacy and discretion as this one-of-a-kind boutique hotel allows advanced ‘reservations only’ and prohibits walk-in customers. Again the hotel never gives out guest names and ‘Guest Codes’ or ‘Secret Words’ are used to identify hotel guests. Ma Du Zi is therefore the perfect Mr and Mrs Smith experience. Additional pleasures at this boutique hideaway include infinity bathtubs, Jacuzzis and the catering to every, exclusive guest need. Ma Du Zi is located a short walk from the Asoke / Sukhumvit interchange where both Skytrain (BTS) and Underground (MRT) meet. A popular hotel with the local hipster crowd (maybe). Possibly the most famous hotel in Bangkok yet the hotel itself gets continually overlooked. The Lebua Hotel is famed location of the alfresco restaurant and bar, Sirocco and Sky Bar, a top spot for tourists and well-known for its appearance in the Hangover II movie (try the Hangovertini). But the hotel itself needs its own mention, with breathtaking vistas over Bangkok and the passing Chao Phraya River, you get everything the bar offers yet it’s not overpriced. Lebua Hotel is found on the top floors of the State Tower building, next to the Chao Phraya River, and within walking distance of the convenient Skytrain network (BTS) at Saphan Thaksin station. 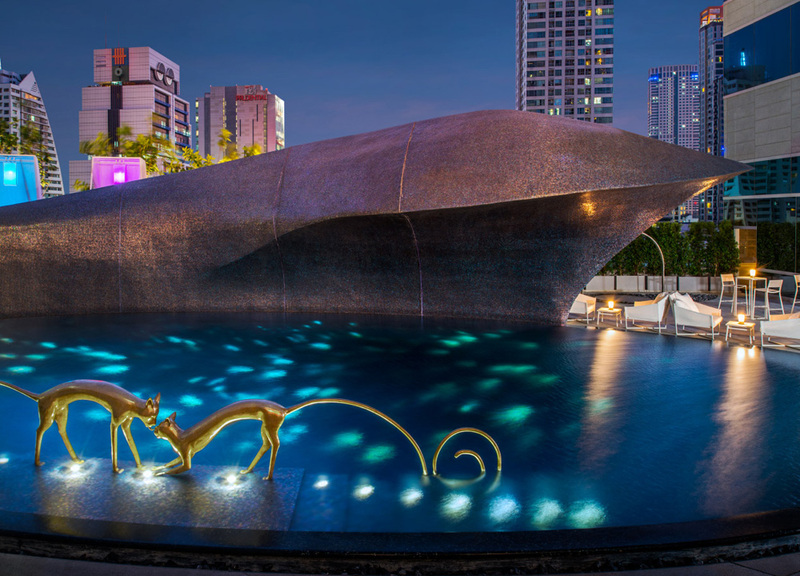 Sofitel So is one of Bangkok’s newest and trendiest, themed design hotels inspired by the Five Elements of Water, Earth, Wood, Metal and Fire. Primarily geared towards the young and trendy of the city Sofitel So has quickly become the new hangout for Bangkok’s ‘Hi-So’ and middle class cool crowds. 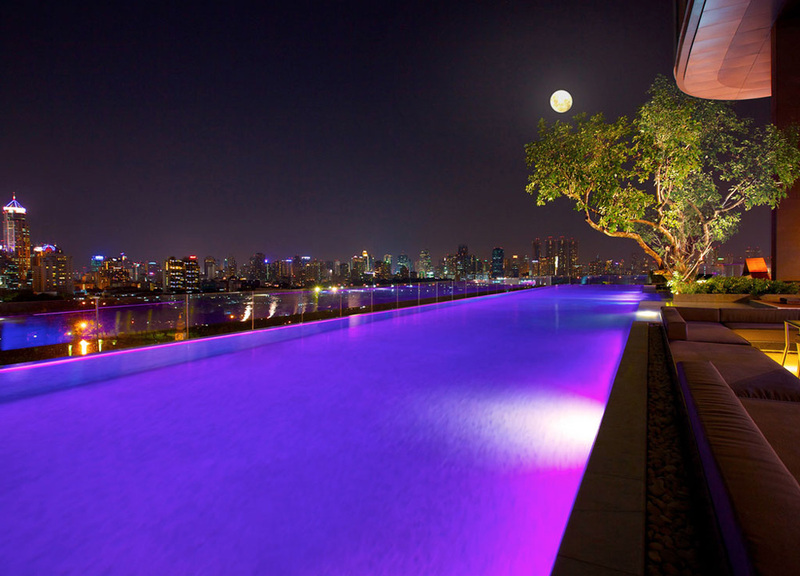 The stylish Park Society rooftop bar, and monthly So Kool Pool Party at the Water Club Pool Bar, are just some of the stand-out events which make this trend setting hotel one of the coolest design hotels in Bangkok. With a high-rise, urban location Sofitel So sits opposite, overlooking Lumpini Park and a short walk finds the convenient Subway and Skytrain lines (MRT: Lumpini, BTS: Sala Daeng). The ‘W’ Hotel remains relatively low-key in Bangkok, however the brand itself is iconic worldwide, lauded for modern luxury decors and its loyal following of young and whimsical clientele. 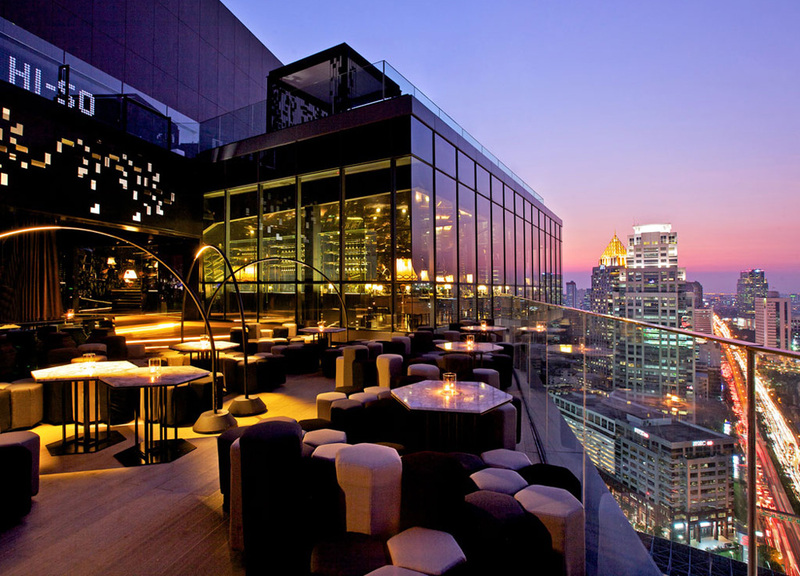 W Hotel Bangkok is the newest addition to this brand, a haven of Asian chic in the city’s urban centre of Sathorn. A design hotel set to welcome the ‘ambassadors, jet setters and fashionistas’ of the city. W Hotel is a somewhat psychedelic experience; indulge in world-class restaurants or mix and mingle in the vibrant Living Room. The creative, infused cocktails of on site Woobar are alone worth the visit. The W Hotel is our newest addition to this list of coolest design hotels in Bangkok and is found in Sathorn’s commercial district, a short taxi from the Chong Nonsi skytrain. Experience a whole new vibe with loft-inspired designed, tech-savvy rooms and a great social scene. This surreal and hypnotic experience brings a playful blend of new design to local culture. Set in the heart of Bangkok’s likely Sukhumvit 11 street Aloft is just steps away from some of the city’s trendiest nightlife and coolest bars, yet for much of it you don’t even need to leave the building. 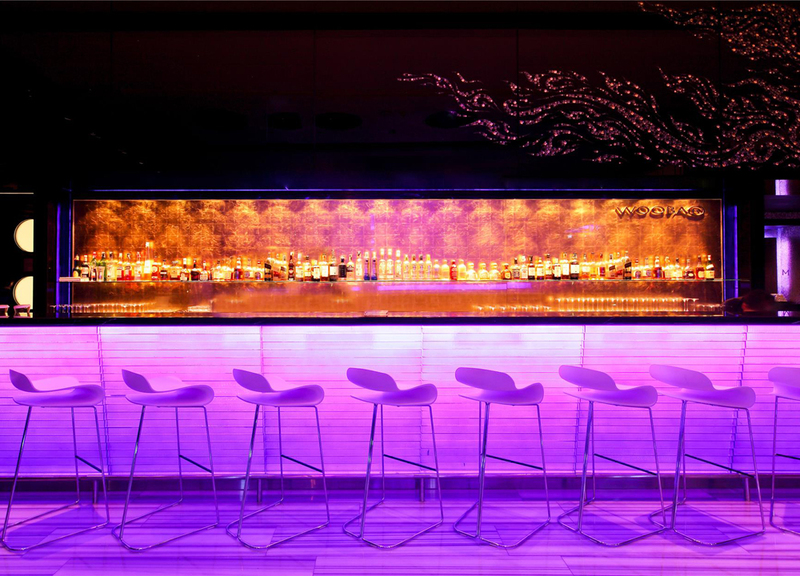 Aloft plays host to many of these hip and happening hot spots including the W XYZ cocktail bar and Levels Nightclub. On the surroundings street is not only nightlife but many of the area’s top restaurants and boutique spas, and a short walk finds Nana Skytrain (BTS) for those inclined to venture further. 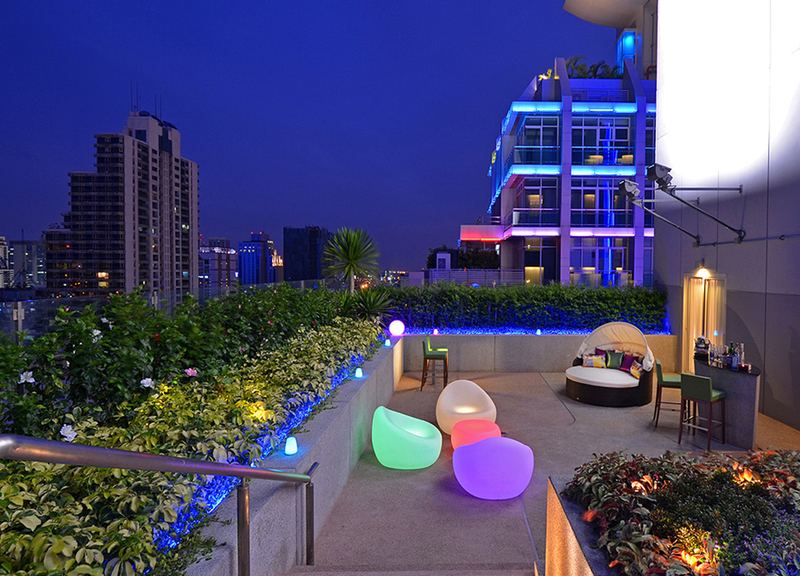 For a more affordable option on Suhumvit 11 check out the nearby Le Fenix with the onsite Nest rooftop bar.